Gizmo, Fluffy and the Fugitoid are taken aboard the Triceraton asteroid ship and the Triceraton Commander issues an ultimatum: If the Fugitoid doesn’t build the transmat, his friends will be thrown out the airlock. With no real choice, the Fugitoid agrees and Gizmo and Fluffy are taken to the brig. Months later, the asteroid ship has docked at the Triceraton Homeworld. Gizmo has spent the time working on his writing, but can’t find any inspiration in this “genre”. He and Fluffy are sent to do more clean-up duty, apparently both irritated that they haven’t figured out a way to break free yet. Gizmo runs a floor buffer over a bar of soap and sends it rocketing across the room at high speed. Feeling inspired, they go to the janitor’s closet to rig up some more “weapons”. Hitching two large buffers together, they ride them down the corridor toward the Triceraton guards. The buffers fire some soap at the guards and then plow into them, knocking them out. 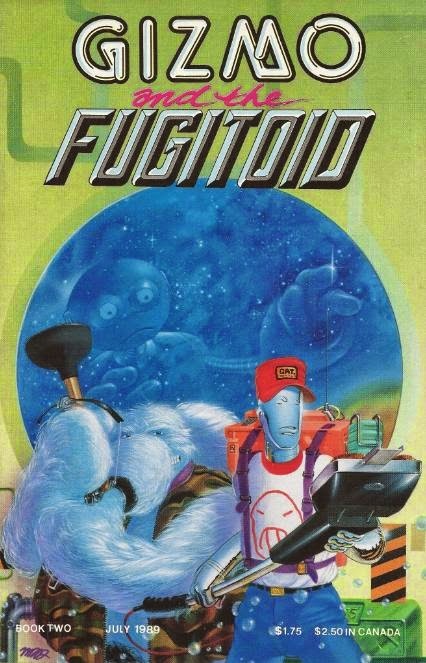 Gizmo and Fluffy use the opportunity to find the Fugitoid in his workshop. The Fugitoid tells them that he can’t leave now, as he must finish the device. Gizmo and Fluffy are confused, but agree to cause a distraction and give the Fugitoid half an hour to finish his work. Gizmo and Fluffy make it to the armory and arm themselves as the Triceratons approach. Gizmo grabs the largest gun he can find, much to Fluffy’s disapproval, and fires it. The kickback sends Gizmo through a wall and Fluffy informs him that the gun he used was built to be installed on tanks. The Triceratons seize the two and prepare to execute them, when suddenly the Fugitoid activates his machine. Apparently, rather than a transmat, he built a new menta-wave device powered by the fusion reactors of the Triceraton Homeworld. The Fugitoid broadcasts a psychic message to all living creatures in the Triceraton and Federation systems. He tells them that the transmat could have been used for peace, but because of their thirst for war and conquest, he has no choice but to take the technology out of their grasp forever. The Fugitoid bids the universe farewell and overloads his circuitry, wiping his memory clean. Gizmo and Fluffy find the Fugitoid’s body and a Triceraton technician confirms that his memory has been erased and he shows no signs of life. Apparently moved by the Fugitoid’s words, the Triceraton Commander allows Gizmo and Fluffy to leave with the body so they can give it a proper burial. On the surface of a nearby planet, they place the Fugitoid’s body under a tree and Fluffy suggests that Gizmo write a eulogy for him. Gizmo takes out his electronic textpad but can’t write anything due to a system error. The message tells him, “To restore system memory, insert DMA cable into Class-C memory unit”. They decide to hook the textpad up to the Fugitoid’s Class-C memory unit and in doing so the Fugitoid comes back online. The Fugitoid explains that he used the menta-wave technology to transfer his mind into Gizmo’s textpad, thereby faking his own death. Gizmo and Fluffy are thrilled, though Gizmo is less than pleased that the Fugitoid had to erase all his document files in order to fit his memory in the textpad. Several months later, down on Earth, a child leaves a comic shop in a hurry. Running past several alien neighbors, he reaches his apartment stoop and sits down to read “The Unlikely X-Bots” (which has a cover featuring three familiar faces). *This story is continued from Gizmo and the Fugitoid #1. *The setting of Earth populated by humans and aliens may indicate these stories take place after TMNT (Vol. 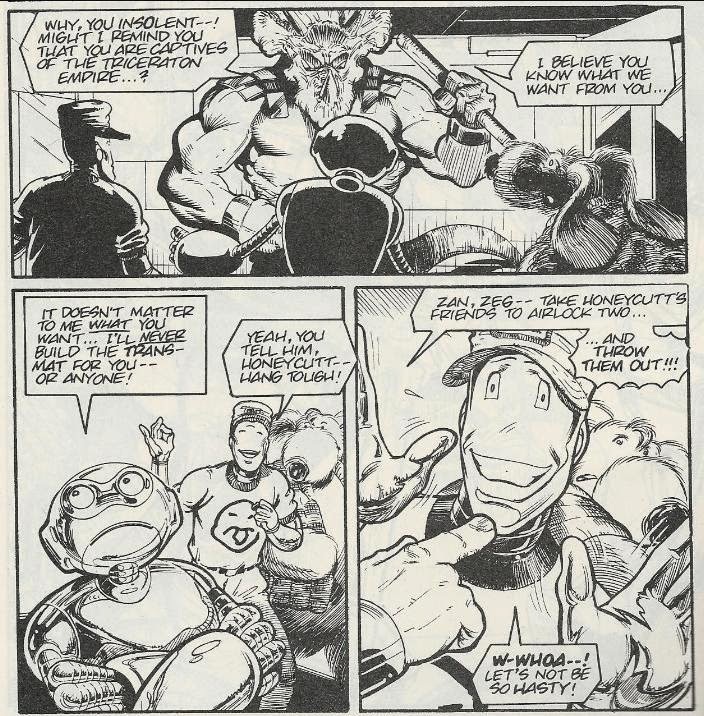 4) #5 (when the Utroms initiated First Contact), but before Tales of the TMNT (Vol. 2) #69 (when global warming destroys the Earth). *The Fugitoid’s mind is apparently only 50gb or less. 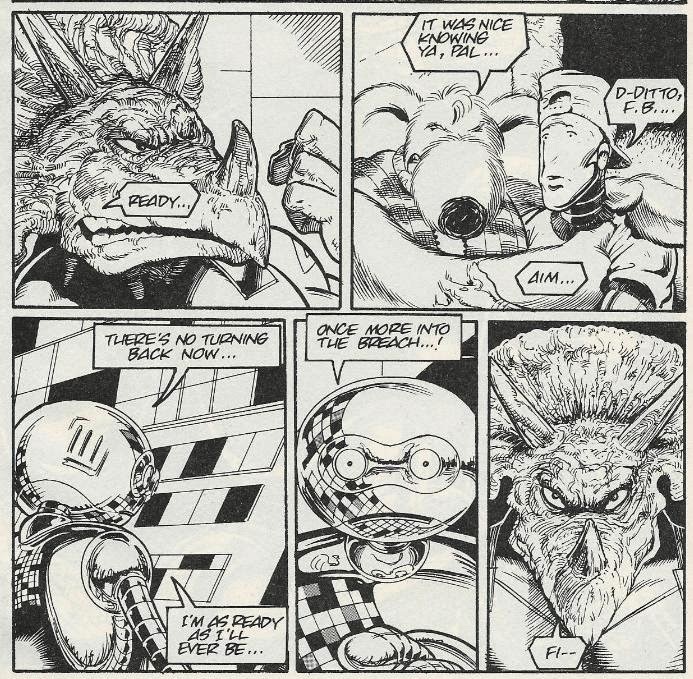 *This issue also contained a bonus pin-up of Gizmo, Fluffy and the Fugitoid by Peter Laird. According to the foreword from the previous issue, this is the piece that inspired Dooney to do the miniseries. The second half of the Gizmo and the Fugitoid miniseries was a little less exciting than the first half. It relies heavily on matters of convenience to get the characters out of their various jams and by the end the credibility almost snaps. The Triceratons apparently just let their captives mull around unguarded for hours at a time to do whatever they want, be it plotting an escape or sabotaging the machines they’re supposed to be building. I guess it’s consistent for the Triceratons, who are typically portrayed as ferocious warriors if not especially intelligent. 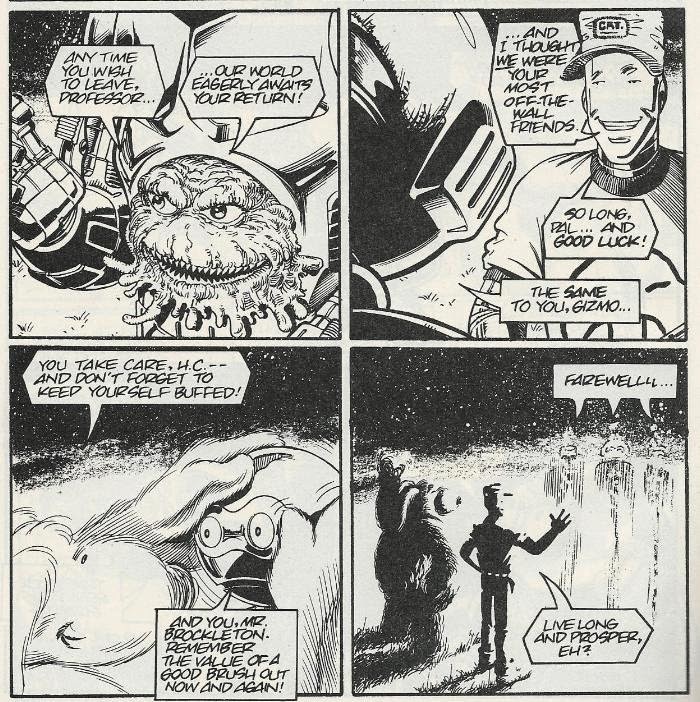 The ending, where the Triceraton Commander allows Gizmo and Fluffy (whom he was seconds away from executing) to leave with the Fugitoid’s body because “meh”… That was simply a means to get the comic over with before the pages ran out. So while it is a step down in its conclusion, Gizmo and the Fugitoid #2 is still enjoyable for all the same reasons the first installment was. Though the Fugitoid takes a backseat for most of the issue, Gizmo’s and Fluffy’s dynamic is as fun as it ever was and there’s entertainment to be had in watching them blunder through their escape attempt. What was great about the Gizmo ongoing series, and this miniseries too, is that Gizmo and Fluffy aren’t idiots, but they aren’t geniuses, either. They usually wing their way through delicate situations and succeed with equal parts resourcefulness and dumb luck. It makes their antics spontaneous and unpredictable, as they have to go through a lot of trial and error to make it out on top. In contrast to the lush jungles of the previous issue, this issue takes place in the sterile environment of a space station. While the environments can get a little monotonous, the metallic corridors illustrate Dooney’s skill at making everything so damn shiny. Once again, the reflective surface on the Fugitoid proves how much effort Dooney was exerting in each panel, as the Fugitoid is constantly reflecting the environment around him with the images warped to the curvature of his torso. It’s really quite glorious. What’s interesting about this miniseries in the grand scheme of the Mirage universe is that it concludes the Fugitoid’s storyline. The Triceratons and the Federats think he’s dead and he can now live in peace, both among the Utroms or outside their jurisdiction (where he’d appear to be just another SAL unit). If you’re reading things chronologically, it’s a solid sendoff to the character, as he finally gets the better of the two opposing forces that made him a Fugitoid in the first place. There’s also the lingering potential that his words may have an impact on the Triceraton/Federation war and help bring an end to it (though that might be hoping for too much). So if you’re interested in what’s essentially the “end” of the Fugitoid’s narrative, then this miniseries is vital reading. And if you’re strictly a Gizmo fan, then this is another fun romp for the pair and is just one more of their episodic misadventures. And for everyone else, there’s a lot of gorgeous Dooney art to feast your eyes on. It’s a pretty great mini, all things considered. So, are you going to go back to the Vol 4 era stories, or will you now review King for a Day and/or other Gizmo stories? I thought it was the "Triceraton Republic" not the "Triceraton Empire"? You know I'm kinda surprised these guys never made it on any of the Turtles cartoons. I'm sure Dooney wouldn't have mined. Dooney actually pitched a Gizmo toy to Playmates as part of the 1980s TMNT line, but they passed on it, so I'm sure he'd have let Gizmo and Fluffy appear in one of the shows if the suits hadn't gotten in the way.